When facing a financial emergency where you feel there is no way you, a payday loan online can become pretty tempting. Of course as many of us already know, such loans come with higher interest rates because of short repayment periods – but that’s not the worst of it. There are some individuals out there that claim they can get you a loan if you pay a deposit first. No reputable lender will ever ask you to pay a deposit on your loan in advance. Please make sure you understand that any one contacting you to do this is a scammer. Let’s begin with the basics: A payday loan is a small, short-term loan that usually ranges around $1000 or less. The funds are typically deposited within your account on your upcoming payday. Payday loans are generally obtained from a brick-and-mortar payday loan store and ever more popularly, from an online lender. The online method is of course growing in popularity for its ease of convenience. Instead of having to move around and locate a store, you can simply find a payday loan lender and fill out an application through searching online. As easy as 1, 2, 3! In many cases, your credit score isn’t even taken into consideration but industry specific scoring is from companies like Factortrust, CLVerify, or DataX. Once the first step of loan approval has passed, you’ll move onto signing a contract with your said lender. Once completed, the requested money is deposited directly into your bank account. Loan repayment is equally pretty simple: You must ensure that you have the money in your account before payment day for your lender will perform automatic electronic withdrawals from your bank account. You receive a phone call from a scammer posing as a payday loan collector. You’re then accused by the fake collector of failing to repay a payday loan. The scammer threatens to sue if you don’t immediately transfer a payment, provide a bank account number or a credit card number. The scammer may also pose as a law firm or government agency and in this case, may threaten to deduct funds directly from your salary. Keep in mind that a scammer can implement many different intimidation techniques, including threatening to inform your family and friends of your financial difficulties or scaring you with arrest if the debt isn’t paid off in full. Of course, the bottom line is that you haven’t taken out a payday loan and therefore owe nothing at all. However, sometimes the scammer can be so convincing and threatening that certain individuals panic and perform the payment. How Can I Avoid Falling into the Traps of a Scammer? If you believe you’ve been contacted by a scammer, make sure you file a complaint with the Federal Trade Commission and your state Attorney General’s office. If in doubt, never provide and personal, financial or confidential information over the phone. In most cases, the scammer attempts to get you to pay immediately – so don’t pay a dime unless you know the debt is genuine. Demand a written confirmation prior to paying any debt. A scam artist will most likely refuse. Turn the tables and obtain the caller’s information instead: Request their name, company name, street address and telephone number. If such information is refused, you can rest assured that the person on the line is most likely a scammer. If the caller actually provides the requested information, take the time to give them a search online to discover whether or not their legitimate. Start by looking at the Better Business Bureau! 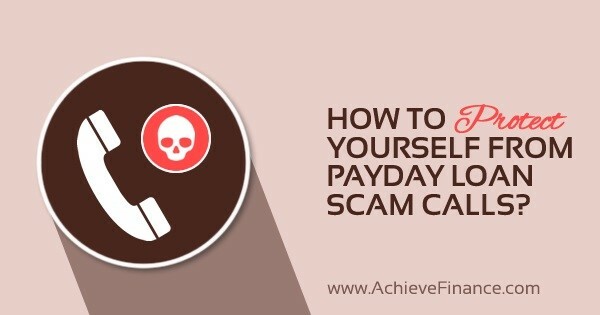 In the end, financial scams stemming from non-existent payday loans are real and cause quite a problem if you happen to fall prey to one of them. However, if you keep the above information in mind when it comes to dealing with possible scam artists, then you’re increasing your chances of staying far away from the problem!